by taking the example of large group meetings of homeless people in germany 1929, 1991 and 2016. In the last hundred years, two remarkable congresses of homeless people are reported in Germany, and a third big meeting will take place in summer 2016. 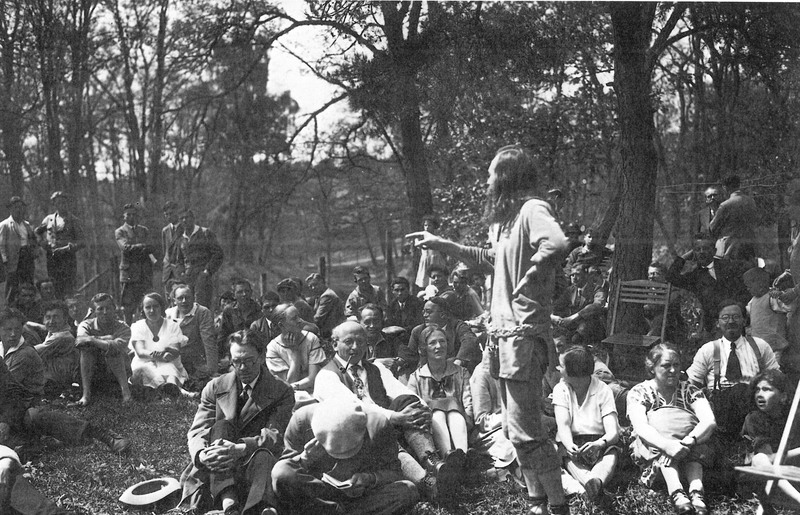 In Mai 21th−23rd in 1929 an „Internationaler Vagabundenkongress“ (International Congress of Vagabounds) took place in Stuttgart, Württhemberg, Germany, organized by the „Bruderschaft der Vagabunden“ (Brotherhood of Vagabounds), headed by Gregor Gog, the „König der Vagabunden“ (King of Vagabounds) with approximately 500 participants (Künstlerhaus 1982, Trappmann 1980). And last but not least, in July 24th-31st in 2016 a „Sommercamp wohnungsloser und ehemals wohnungsloser Menschen“ (Summer camp of homeless and former homeless people) will take place in Freistatt, Lower Saxony, a former labor colony, organized by Bethel im Norden, a provider of social services for homeless (Kruse/ Schneider 2016). While the conferences of 1929 and 1991 are halfway documented (and the meeting of 2016 is halfway prepared), we have almost no research work about the effects of this meetings to the social work with homeless people. On the other hand topics like empowerment and participation will become more and more influence in the current debates of social work with homeless (Schlembach 2012). In a comparative analysis we will ask for the social occasions, the motivations, the aims, the effects, the perception in the public and the impacts and influence of those meetings on social work with homeless. Can we find some impacts on social work from these events and what are the conclusions regarding the support of self-organization, empowerment and partizipation of homeless people by the social work (Scheu/Autrata 2013, Schneider 2010)? Künstlerhaus Bethanien (Hrsg) 1982: Wohnsitz: Nirgendwo – Vom Leben und vom Überleben auf der Strasse, Verlag Fröhlich und Kaufmann, Berlin. Fähnders, Walter, Zimpel, Henning (Hrsg.) 2009: Die Epoche der Vagabunden. Texte und Bilder 1900–1945. Klartext Verlag, Essen (Schriften des Fritz-Hüser-Instituts 19). Powser, Karin 1993: Obdachlos – keine Gnade auf der Straße. Fotografien. Texte Drinnen & Draußen, Heft 6, 1993. Hrsg. : Hannes Kiebel. Scheu, Bringfriede/ Autrata, Otger 2013. Partizipation und Soziale Arbeit: Einflussnahme auf das subjektiv Ganze. Forschung, Innovation und Soziale Arbeit. Wiesbaden: Springer VS.
Schlembach, Julia 2012: Partizipation wohnungsloser Menschen: Eine qualitative Untersuchung der Betroffenenperspektive Esslingen 2012.